After a period of early access on PC and Xbox One, Anthem has now finally launched on all platforms, introducing BioWare's take on the loot shooter. In this Anthem guide, we'll be walking you through all the essential Anthem tips that all Javelin pilots should know before delving into the game for the first time. Throughout this guide, we’re going to be running through all the basic information that you need to know about BioWare’s Anthem. Firstly, you can find a story primer on the world of Anthem just below. Further down, we’ll be detailing everything there is to know about the Javelin exosuit classes in the game. Simply speaking, Anthem is a post-apocalyptic third-person shooter. The game is set in a world where literal Gods have harnessed the power of the ‘Anthem’, to create a brand new world. However the Gods themselves vanished before completing said world, and it’s this ruined world in which Anthem takes place. In the unfinished world, humanity now lives in small settlements, struggling to survive against the monsters in the wilderness. But, there’s a faction of humanity known as Freelancers, which operate in powerful Javelin exosuits to battle threats against mankind. It’s this faction that you’ll belong to in the story of Anthem. We said Anthem was a third-person shooter, but that’s selling the game a little short. You’ll traverse a massive, shared open world over the course of Anthem, battling monsters of all shapes and sizes as you struggle to keep humanity safe. This will all come to a head when Anthem launches on February 22, 2019, for PC, PS4, and Xbox One. In total, there are four Javelin exosuit classes in Anthem: The Ranger, Colossus, Interceptor, and Storm. All four classes have distinct weapons and abilities, that are exclusive to that class only. You’re going to be using your Javelin exosuit to fly around the wide open world of Anthem, but you can switch between all four exosuits when you get deeper into the game. If you want a complete overview of the control scheme for Anthem, you can head over to our Anthem Javelin controls guide. 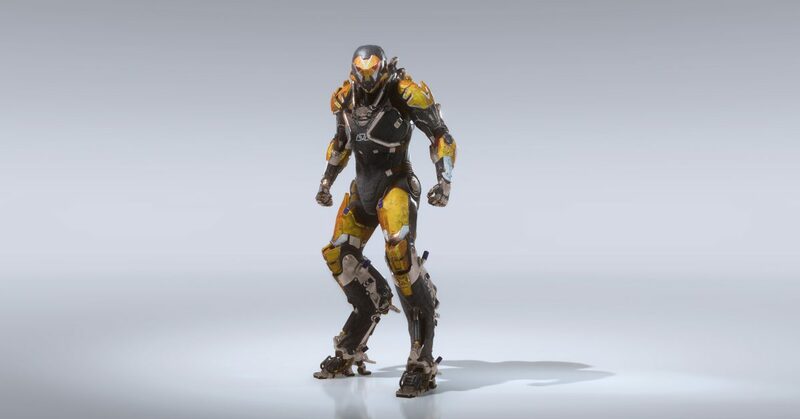 This Ranger-type Javelin is going to be the exosuit that all Anthem players start out with. 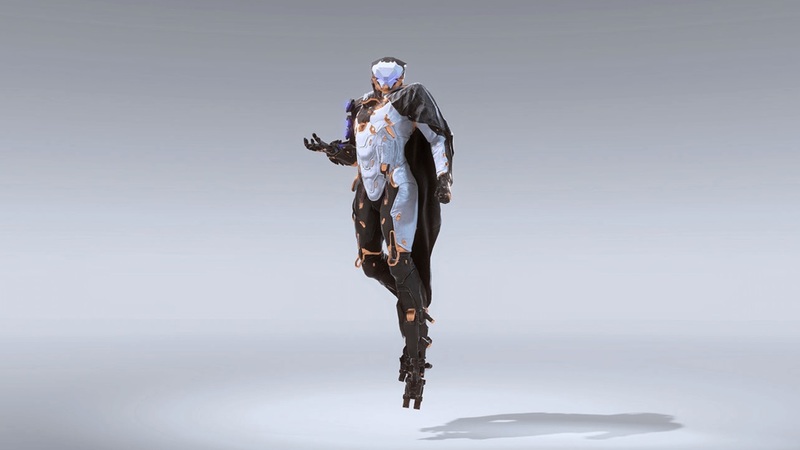 Basically speaking, it’s the most versatile of the four classes, but from here you can unlock the additional three Javelin classes in Anthem (more on them below), and switch between all four. For all the information you need to know on this type of exosuit in Anthem, make sure to head over to our Anthem Ranger Javelin guide. You’ve probably already seen the Colossus in footage from Anthem: It’s the big, hulking exosuit. As you can probably tell from the exterior, the Colossus specializes in heavy weaponry, stomping through the wilderness with rocket launchers, flamethrowers, and more heavy weapons of destruction. 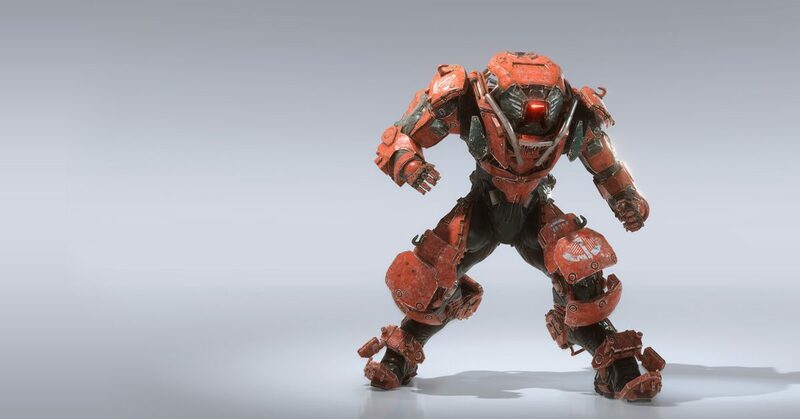 If you want the full lowdown on the abilities, weapons, and gear for the Colossus exosuit, then make sure to check out our Anthem Colossus Javelin guide. 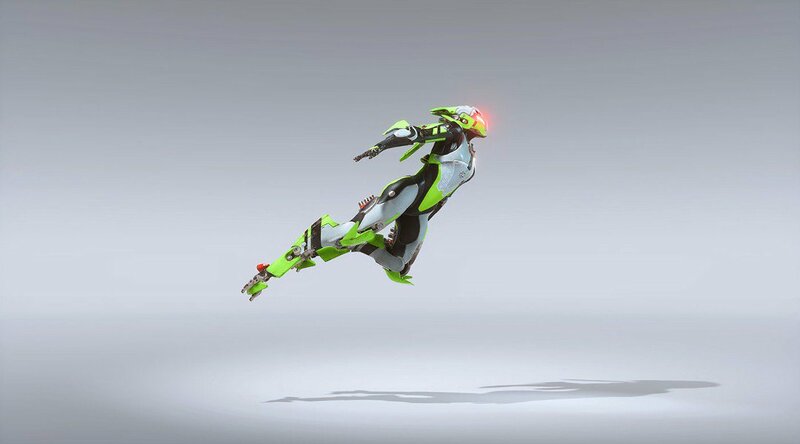 The Interceptor is the most agile of all four Javelin classes in Anthem. It definitely isn’t the strongest of all four classes, but it’s easily the quickest, able to rapidly get up close and personal with enemies, and deal some serious damage with blades. For a full walkthrough of all the various weapons and abilities that the Interceptor class has at its disposal in Anthem, you can head over to our full Anthem Interceptor Javelin guide. From the writing on the official Anthem website for the Storm Javelin, it sounds a lot like this exosuit will unlock after the other three, deeper into the game. It’s basically the wild card of all four Javelin classes, wielding some devastating elemental weaponry and attacks, but with very little armor. 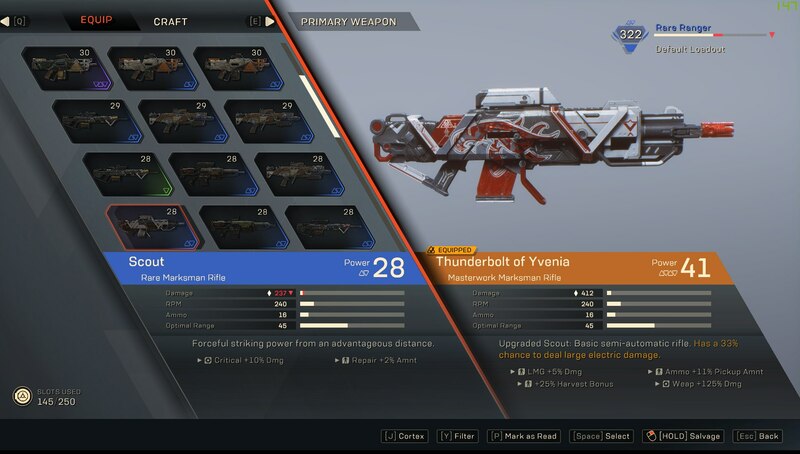 If you’re after a complete list of all the weapons and abilities that the Storm class has available in Anthem, simply head over to our Anthem Storm Javelin guide. While there are common, uncommon, rare, and epic levels of gear in Anthem, one tier rises above the rest: Masterwork. There's a set amount of Masterwork weapons for you to earn in the game, and they all come with unique abilities that bring more destruction to the battlefield. For a full walkthrough of every single Masterwork weapon we've found so far, as well as how to unlock the elite weapons, head over to our Anthem Masterwork weapons guide. Strictly speaking, Anthem only has a PvE gameplay mode, as PvP won’t be coming to the game, at least at launch. Strongholds act as a way that up to four Anthem players can easily join up as one force, and delve into a fortress of enemy troops and powerful opponents, for some rare loot. For a full breakdown of the Stronghold mode in Anthem, head over to our Anthem Stronghold mode guide. A lot of Anthem is going to revolve around getting your hands on better loot items. It’s not entirely unlike Destiny, where you’re grinding out activities and various mission types like Strongholds, in order to get better weapons and armor for your Javelins. For a full breakdown of the way that loot and gear progression will work in Anthem upon launch, head over to our Anthem progression guide. 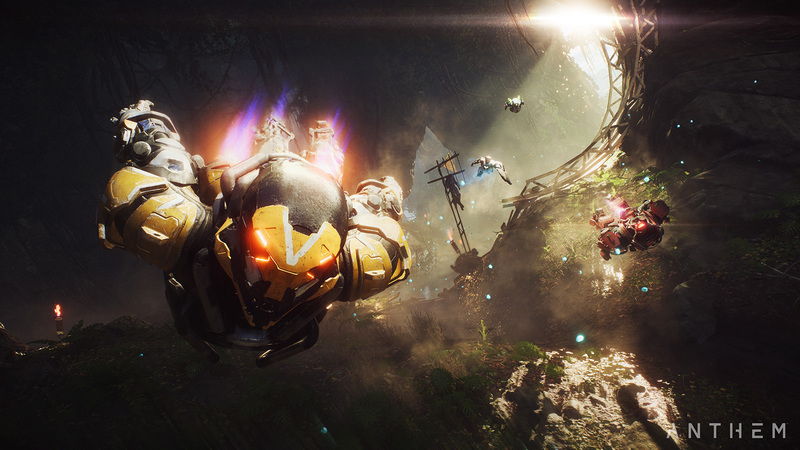 As we mentioned at the top of this guide to Anthem, the game will be arriving on PC, PS4, and Xbox One. The game thankfully supports an Xbox One controller on PC, so if you'd rather play on PC but can't stand using a mouse and keyboard, you're in use. For the full lowdown on the both the minimum and recommended PC specs for Anthem, you can check out our complete Anthem PC system requirements guide. Yes, there are microtransaction purchases available within Anthem. The in-game store for BioWare's game allows you to purchase new armor sets for all four Javelins, as well as crafting items that you can earn while simply playing the game. For all the pricing information you need on the currency, head over to our Anthem Shard prices guide. Anthem might still be around the corner from finally launching, but EA has already outlined content that'll be arriving after launch. There's still a fair bit that's unknown about the post-launch content for Anthem, but we do know that there'll be an increased level cap, new weapons and armor, new Strongholds, and more. For a complete walkthrough of everything we know so far about the content coming to BioWare's game after launch, you can head over to our Anthem DLC guide. There's a now infamous mission amongst the Anthem community in which you must open Tombs around the world. You'll need to collect Chests in order to progress, and they're fairly well hidden around the map. To help you out, we've been busy, marking all of the Chests we've come across in our Anthem Chests Guide. Head over there for more info. No matter if you've just stepped into your Javelin for the first time, or if you've already been exploring Bastion for hours, these are some Anthem tips everyone should know. Remember to pay attention to the heat level of your Javelin! A bar will increase in the middle of the screen while you're flying, and when this fills up completely, you'll fall out of the sky. To decrease the heat level of your Javelin, angle your flight trajectory downwards, or land in some water to cool off. It can be easy to forget about your secondary weapon. To switch weapons, hold down the reload button. In Fort Tarsis, you'll know if someone has a mission for you if there's a person-shaped outline in the yellow box above their heads. Alternatively, if there's speed bubbles in the yellow box above an NPC's head, they just want a friendly chat. Salvaging your gear is essential for crafting materials. In the Forge, hold X/Square over any piece of gear to salvage it for crafting components. Remember that there's no automatic respawning during missions in Anthem. If your Javelin health decreases to zero, you'll need someone to come over and revive you. On top of this, if your entire squad is wiped out in a mission, you'll restart from the previous checkpoint. Remember to stick together! The combo is king. Make sure you know how the system works. You can hold dodge to chain them together, particularly useful for the Interceptor. And with that, our guide to Anthem comes to a close. As we draw nearer to the launch of BioWare’s big new game, we’ll make sure to keep all our guides updated with any new information that comes our way.